^ back to A-Z. - Index. Moped's from Finland Finland mopeds. HYVIÄ MOPOJA - FINA MOPEDER - EXCELLENT MOPEDES . 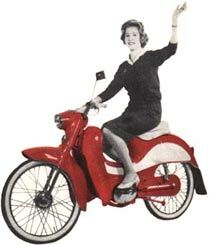 Mopedin - mopedit links / suosikit / linkit : Finland. ● JONAS ØGLÆND - SANDNES, NORWAY. 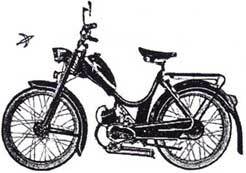 ● Tekniikan Maailma 6/60: Moped mark list. 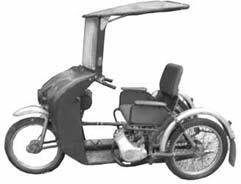 ● Vanha mainos: Body & moped protection. Partner, N.M.V. Norsjö Mek. Verkstad. ● INVALIDI MOPEDI katettu malli, ajokorttivapaa. ● PYÖRÄTUOLEJA kiinteitä ja kokoonpantavia malleja. KONE JA TERA OY: Peto - Panther - Jaguar. 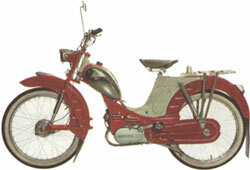 DKW (D) Zweirad Union Ag DKW. 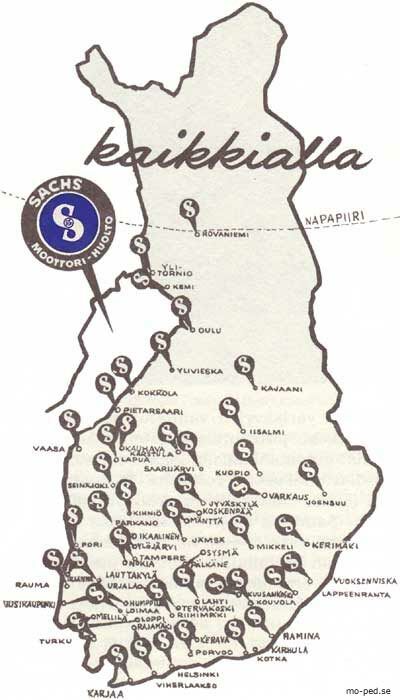 Pohjoismainen Sähkö Oy Helsinki - Vaasa - Oulu. JAWA (CZ) Imp: Suomen Koneliike, Helsinki. Imp.1: Importer: Konetuote Oy Helsinki. Imp.2: Maahantuoja / Importer: Auto-Nopso Oy Helsinki. RABENEICK (D) Yksinmyyjä KESKO Asiakaskauppiaineen. Wholesale: Oy Supo Trading Ltd Pori. Soumen Polkupyörä- ja Konetehdas Oy Turku. 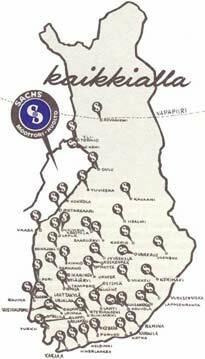 Piirimyyjiä kaikkialla Suomessa - Säljare över hela landet. Norden Express 1210 A. J. Soininen Oy, Kuopio. ● There are errors in the facts, please correct. ● Tosiasiat voivat olla väärässä, korjaa. Don't forget to send pictures, photos! Swing -59, Swing/47 -60, Sport Swing/47 -63. Anker [Anker Zweiradvertriebs-GmbH.] 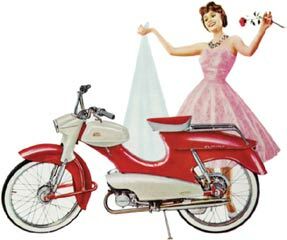 (D) "Shell 2 T Two Stroke-öljyä". AFS 5023 Luxus -58, AFS-5023/47 -59, AP 560 Luxus/47 -59. E3/49 - 58, G 2M/50 -59, MG 1 /49 -59, Sport/49 -60, de luxe C3/49 -60. 592-Rapid/48 -60, 593-SA Master/48 -60, 593-SA Sport/48 -60. B 57/47 -58, B 57ge/47 -58, Sport 60/47 -60. Brummi 10 - 60/47 -58, Brummi 20 -58. Sport Swing -62, Swing 2MA -64. Hummel F 12/49 -60, Hummel 113/48 -61. S37/47 -59, 2000/47 -59, 2000/47 -60. Fratz IV MD/50 -58, Fratz MD 50 E/49 -58. Avus Gs III/47 -58, Avus Ge III/47 -60. Diva 314/47 -58, 324/47 -59, Export 324/47 -59. Hopeasauma ● Hopeapääsky ● Hopeasiipi ● Sisu ● Vasama. Sport Swing/47 -63, Sport 2 MA/47 -64. FM 405/39 -61, Luxus 50L/49 -61, Populär 50P/49 -61. MM 2/44 -58, MM 10/49 -60.
de luxe MM 8/49 -61, H/49 -62. 50 2 MA/47 -64, 50H HVA/48 -64. Jawetta S 22/50 -62, 551 Standard -62, 551 Sport -62. 219 Prior/47 -58, Milano 23 Ds/47 -58, Prior 219/47 -59, Prior 219/47 -61. 50 2MA/47 -63, Sport 50-2MA/47-64. Monza /47 -58, Standard 26 S/47 -58. 24 -58, 24F -58, 309 FS/49 -59. Monarpeden: 24/49 -58, 24F -58, 34 F/49 -59, 349 F/49 -59. 1273 HVA 48 -63, 1212 ILO/49 -64, 1232 ILO/49 -64. 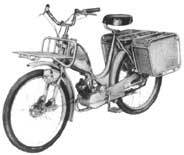 Tavaramopedi (transport moped guide) -57. Saxoped S39/47 -60, Express 1210 tavaramopedi, transport guide. 2000 M/47 -61, 8038/47 -61. Quickly -58, Quickly L/49 -58, Quickly S/49 -60. 1134/47 -59, 1136/47 -59, 2000 S/47 -59, 2000/47 -59. 500/47 -59, 501/47 -60, 505/47 -59. Panther Bobby 5/47 -58, Panther B-8/47 -60. Special 2000/47 -59, Special Saxoped 1126 -59, 1136/47 -60. 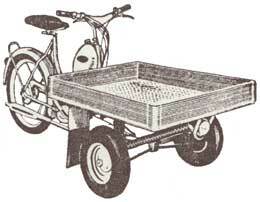 Piaggio Ape 50. ● NRK TV: Øystein Bache och Rune Gokstad. Berini M21/48 -58, Berini M22/48 -58. 1136/47 -59, Saxoped S39/47 -60. Saxoped S39/47 -60, 2000/47 -60. Swing -59, Swing/47 -59, Swing/47 -60, Swing/47 -62. 1,4 MS 50/49 -58, VS 50L5/48 -60. Luxus/49 -61, Luxus 63/49 -62, Luxus64/49 -64. III/47 -64, IV 2MA-A/47 -64. Rexoped Royal/47 -58, Favorit/48 -59, Royal/48 -59. Standard Luxus/47 -58, Export de luxe 5/47 -58. SR 2 - 58, SR2/48 -58, SR 2/48 -59, SR 2/48 -60. Solifer Tavaramopo -83. (transport guide). Sport Luxus/49 - 1960 [Myynti: OTK-Osuusliikkeet.] () HMW-motor. 320/47 -60, 324/47 -60, 324/48 -61, M62-L/47 -62, M62-M/47 -62. 14 K/47 -58, Svalette/49 -59. Swing/47 -58, Swing/47 -59, Swing/47 -60, Swing -62, Swing S -62. AGI III 514/47 -59, ELF I-09/47 -59, ELF II-10/47 -59, Sport II-12/47 -59. 50/49 -61, 50 4T/49 -61. 1126 -58, 2000 -58, 1136/47 -59, 1134/47 -60, 1136/47 -60. Sport Swing/47 -63, Swing 2MA -64. 1126 -58, 1136/47 -59, S37/47 -59, 2000/47 -59, 2000/47 -60. Vicky F" 38 L/38 -60, Vicky Std 113/48 -61, Vicky FM 38 L -62. KONERA Vaasa - Seinjoki.] Pääedustaja Suomessa Uotila Oy, Helsinki. Combinette 423/50 -58, Combinette 428/49 -59. Swing 47 -63, Swing 2MA/47 -64, Viking Swing/47 -64. Please help correct errors. Complete pictures, facts?! I can not Finnish. P.S. Hope you enjoyed the page. Regards, P. Blomberg, Stromstad - Sweden. Auttakaa korjata virheet. Täydellinen kuvia, tosiasiat?! En voi suomalainen. Loppusanat Toivottavasti pidit sivun. Terveisin, P. Blomberg, Strömstad - Ruotsi.